The first reason is because all of the solutions we use are 100% safe for your family and your pets too. In demos, we will even drink a glass of our cleaning solution, The Natural®, to prove how harmless it is. We know it is safe because it is green-certified and found on the FDA GRAS list. We are a green cleaning Fort Wayne service. It doesn’t contain any soaps or detergents or chemicals at all. If it is safe for us to drink then you can be sure it is safe for your family and, of course, your carpet too. The second reason Chem-Dry of Fort Wayne is the healthiest choice for carpet cleaning is because we use so little water. We use 80% less water than services that steam clean carpet. Services that use a lot of water run the risk of leaving excessive amounts of moisture in the carpet which can lead to mold and midew growth. Mold and mildew can damage your carpet and lead to shortness of breath, chest pains and other respiratory side effects. 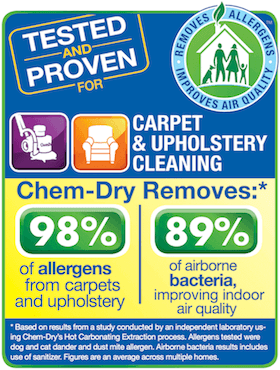 The third reason is that Chem-Dry of Fort Wayne removes allergens from carpet. 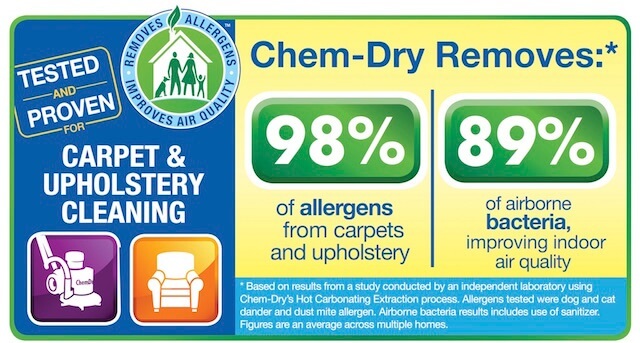 You wouldn’t think to schedule carpet cleaning for allergy relief but our service actually removes over 98% of allergens from carpet and upholstery. Pet dander, dust mites, toxins and other allergens trapped in your carpet are extracted with our Hot Carbonating Extraction and gone from your home for good.